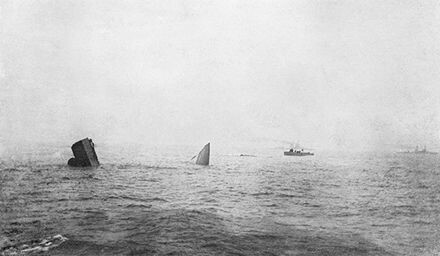 The battle of Jutland remains the most controversial naval engagement in history, and 100 years on, the debate continues. Andrew Gordon’s The Rules of the Game contains probably the best analysis of the actual fighting. Two conclusions can be drawn from the battle. That it revealed a terrible flaw in the management of British fire control systems (safety procedures were dropped to maximise rates of fire) but also that the result did nothing to break the stranglehold of Germany by British seapower. Fisher’s ‘5 Keys’ still locked in the Germans. © IWM (SP 2468) HMS Invincible explodes. Reverend Guy Browning. At Dulwich 1890-96. Having read Mathematics at Cambridge (he was a wrangler in 1900), he was ordained and became a Naval Chaplain in 1903 serving on many capital ships (including Dreadnought itself) before being posted to the battlecruiser HMS Indefatigable in 1915. 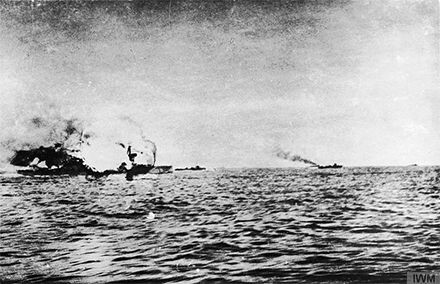 The Indefatigable was struck in the first phase of the battle by shells from the Von der Tann causing her magazine to explode killing all but three of her 1,019 crew. Fleet-Surgeon Hugh Norris. At Dulwich 1889-1891. Having qualified as a doctor at St Thomas’s Hospital, Norris joined the Royal Navy as a surgeon in 1898. He served on various fleet stations, including HMS Tamar in Hong Kong and HMS Excellent in Portsmouth before joining the Indefatigable. He too died in the sinking of the ship. © IWM (SP 2470) HMS Invincible sinking. Engineer-Lieutenant John Hine. At Dulwich 1889-1890. He was in the 1st XV in 1890-91, and a very talented athlete. After Dulwich he joined the family firm of the shipping line Hine Brothers of Maryport, Lancashire. During the First World War he initially joined the army in the Sherwood Foresters, but with his engineering and marine experience he transferred to the Royal Navy and was appointed an Engineering Lieutenant on HMS Invincible. Invincible was part of the 3rd Battle Cruiser Squadron which was deployed with the main Grand Fleet. They engaged the High Seas Fleet as visibility was declining. Invincible was struck by shells from the Lützow and Derfflinger and the explosion in Q turret again caused the magazine to explode. Only 6 of her crew of 1,026 survived.